Cleaning Diamonds Makes Them Sparkle Again | Cohen Bros. Most people think that since diamonds are the hardest of all the gemstones they can never lose their sparkle or brilliance. They do NOT dull or stop sparkling, they just get dirty. Diamonds are magnets for all kinds of materials which will stick to them and make them lose their sparkle. Finger prints are a prime example. The oils on your fingers can stick to the diamond and make it lose some of its brilliance. In fact, every time I deliver an engagement ring, I give the young man who purchased it a speech about not letting ANYONE touch it until he proposes, because the first time the young lady sees it, the ring should be at its most brilliant. Hand lotion, soap, cooking materials and perspiration are all things that can stick to a diamond and cause it to not look its best. So what can you do about this? First of all, if you are ever in New York City, please stop in and I will be very happy to clean it for you at no charge. 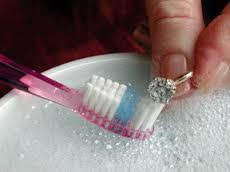 For at home cleaning, there are several types of jewelry cleaners that you can buy, and they are all equally fine. They will come with a brush. Use it! It’s very important to brush the back of the diamond because that is where it’s going to get dirty. You can use a toothbrush and toothpaste and it will work just as well. If the diamond is really dirty you may want to let it soak for a while in jewelry cleaner, or rubbing alcohol, and then go at it with a brush. I always stress to my customers the importance of keeping their jewelry clean, but I have an ulterior motive, I can’t deny it. I want all my customers to be walking advertisements for me and for that to happen the jewelry must look its best.